Kelly is hosting a survey linkup! 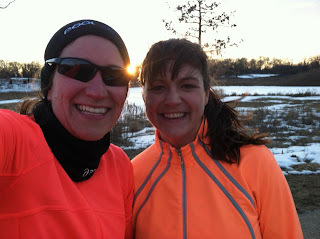 Answer the running blogger survey questions and add your link to her post! 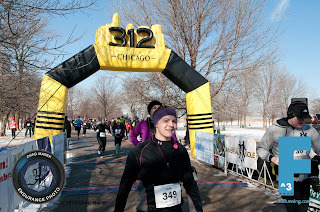 Probably the F^3 Half Marathon. I didn't plan to "race" this race, but I wanted to get in a good training run. I felt so great and it ended up being a 6 minute PR! A great bra, black capris, and a tech tee. And I really shouldn't forget a great pair of socks and running shoes. My favorite socks are these ones--they have seriously saved my blister problem. Plus lots of BodyGlide and my SpiBelt. Of course lately, it's been more like pants and long sleeves plus gloves all.the.time. Hmm. I have this weird problem where I run too close to the edge of the sidewalk and have to force myself to run back towards the middle. I'm afraid of another sprained ankle. Hey, I'm clumsy. Very rarely do I get up early enough to do a morning workout. Only when I know there is no way I can do one in the evening and I go to bed super early. The after-work workout is my jam. Sometimes I try to convince myself to become a morning exerciser but that snooze button is just too easy. It's too cold or icy or when it's raining too hard. I try not to run in the dark by myself, but I do finish runs in the dark. I normally don't let the cold stop me from running and just bundle up more, but if it's too cold, I'll just run on the treadmill. I did have some knee pain before my first half marathon, but with adding in more cross-training after the race, the pain went away. I think it was mostly due to IT band tightness. Last fall on vacation, I rolled my ankle and the swelling was pretty out of control. I didn't even post the worst of the pictures because they were too disgusting. And severe swelling lasted for at least a week. For that injury, I just made sure to rest and took a few weeks off from running. 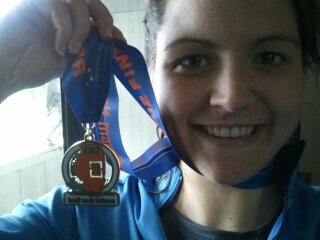 I think it's a tie between my first triathlon and when I finished my second half marathon and had a huge PR. At my half marathon, I think that was one of the first times I really felt like a runner instead of someone who runs. I trained well and even with being sick on race day, I raced well. And also my half PR is no faster than Matt's and I always thought he was a much better runner than I. 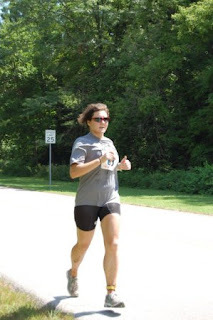 Doing a triathlon had been on my mind for awhile so completing one was awesome for me. I love to tell people that I am a triathlete. Usually they are so impressed, but I always tell them that they could do one too! Finish my first marathon! Coming up in a week and a day! Finish my second half Ironman! Answer one of these prompts in the comments or make your own blog post and linkup!